Use a heavy streamer, such as a sculpin or a pattern with a conehead. Use a fairly long leader–9 or 10 feet–which will allow the fly to get down in the water column and move in a lifelike way. Make sure you keep the fly line trapped under your “trigger finger,” so you can set the hook quickly, making sure to strip-set or sweep-set. After you cast, make a mend to help the fly get down, and then start a modified high-sticking presentation. The difference between this and high-sticking a nymph is that you want to maintain continuous contact with the fly, so you can feel a strike. 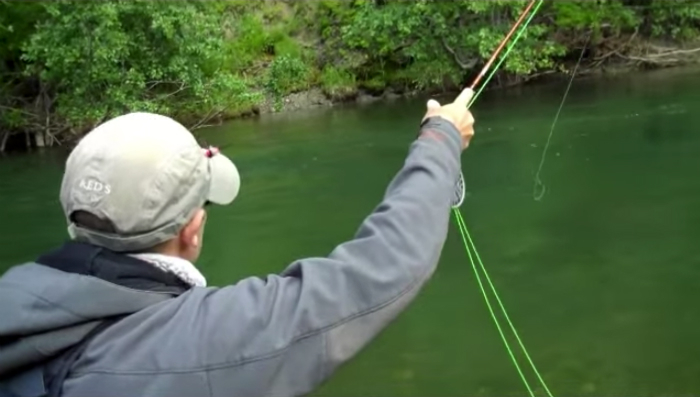 As the fly starts to swing at the end of the drift, use your rod tip to impart a steady, rhythmic action. Fish the fly at different levels of the water column by adjusting the upstream casting angle and using larger or smaller mends. Concentration is key because a fish could strike the fly at any point in the drift or swing, and you’ve got to be ready. This is an excellent way to cover a lot of water, and it’s more interesting than the standard down-and-across, strip-strip-strip method. So give this a try next time you’re wading a good piece of streamer water.